24 candied pecans, or your favorite nut, pistachios would be beautiful! 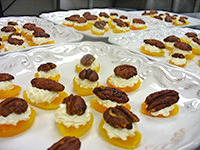 With a hand or stand up mixer, whip chevre and spices with paddle attachment on low speed until creamy and well blended - place in zip lock bag with small whole cut in the corner - "pipe" the whipped chevre onto the split apricots and top with spiced pecan- display and enjoy! For spiced pecans, toss nuts in a 2/3 honey 1/3 melted butter mixture and flavor with your favorite spices. Bake on a nonstick sheet pan in a 250-degree oven until toasted golden and fragrant, cool completely before using. Recipe provided by Celine and Company Catering, "On Broadway".